Two of the judges presiding over the case have ruled that Texas representatives drew maps in 2011 in a discriminatory fashion. The 2-1 decision nullified three of the congressional voting districts drawn by the Texas Legislature in 2011 – CD 23, 27 and 35 held by U.S. Representatives Will Hurd (R-Helotes), Blake Farenthold (R-Corpus Christi), and Lloyd Doggett (D-Austin) respectively. The dissenting judge, Judge Jerry E. Smith of the U.S. Court of Appeals for the Fifth Circuit, wrote that the panel erred in not dismissing the original suit because the issue was moot. On Tuesday, the court amended the March 10 order on Plan C185 to clarify a few issues that the court has not decided. Judge Smith suggested to his colleagues that “we should move on to review the 2013 plans and, as to the 2011 maps, accept the Fifth Circuit’s mandate—in a decision that reversed this very panel in this very redistricting controversy—instead of trying to keep the case on life support.” In issuing a scheduling order this week to proceed with the 2013 plans, the court is apparently complying with that part of Judge Smith’s suggestion. The named defendants in the lawsuit, Shannon Perez, et al. v. (Governor) Greg Abbott, et al., include the State of Texas, and in their official capacities – the governor, lieutenant governor, speaker of the Texas House, the secretary of state, and the chairman of the Republican Party of Texas. In an April 20 ruling addressing another 2011 enactment, “Plan H283,” the two federal judges found that these congressional maps were drawn to discriminate against minority voters, especially Hispanics. Judge Smith dissented once again writing that the ruling was “fatally infected, from start to finish, with the misunderstanding that race, rather than partisan advantage” was the legislator’s intent. 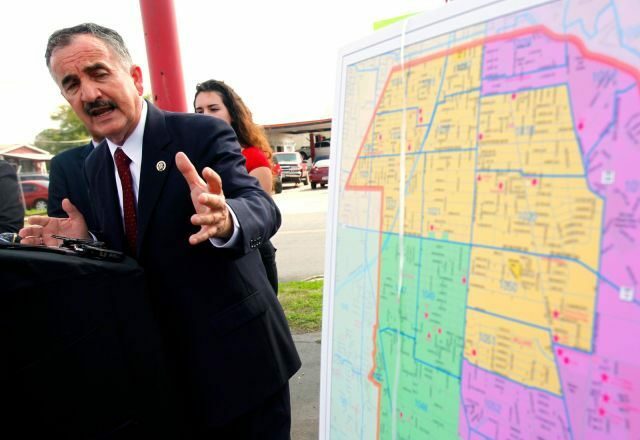 As reported by Breitbart Texas, the judges in reviewing Plan H283, ruled in favor for the plaintiffs’ vote dilution claims under Section 2 of the Voting Rights Act and the Fourteenth Amendment for: El Paso County (HD 78), Bexar County (HD 117), Nueces County (the elimination of HD 33 and the configuration of HD 32 and HD 34), HD 41 in the Valley, Harris County, western Dallas County (HDs 103, 104, 105) Tarrant County (HD 90, 93), Bell County (HD 54), “and with regard to Plan H283 as a whole.” They also sustained the racial gerrymandering claim for HD 117 in Bexar County, and found that while the plaintiffs did not prove a statewide violation under one person, one vote claims, they did prove them as to violations in Nueces, Hidalgo, and Bell/Lampasas County Districts (HDs 32, 34; 31, 36, 39, 40, 41; and 54 and 55 respectively). Dissenting Judge Jerry Smith addressed the fundamental issue of jurisdiction saying as in his March 10 dissenting opinion on the 2011 Plan C185, the judicial proceedings for Plan H283 are moot. “Nothing has changed to fix that fatal defect.” He opined that the panel should “promptly dismiss” the case for lack of jurisdiction.